Chris Wright now turns to GOD’s image bearers – us, and looks at what the Bible says about us and how that impacts on how we do mission. To be human is to be the image of GOD. Kind of powerful. And several books in itself. Anything that denies other human beings their dignity or fails to show respect, interest and informed understanding for all that they hold precious is actually a failure of love. He goes on to cover how our image bearing status has a lot of important aspects in how we live. we were created in relationship – the first not good of the Bible follows on from a long list of …and GOD saw that it was good… – and that not good was applied to the man’s state as being alone. This was not that he was emotionally and needed a companion – a merely emotional, psychological not good (though it includes that) – it is much more. The fact is that as bearers of GOD’s image we need to be in relationship as GOD is in the trinity, and with us. We are created relational because GOD is relational. 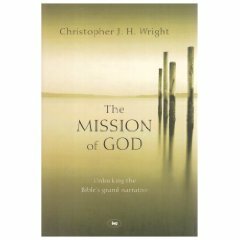 Wright goes on to cover the impact that sin has on us as GOD’s image bearers and uses HIV/AIDS as a paradigm of how we are broken and how the church should respond. He closes he chapter with a review of the wisdom literature and the common place finding of doubt, questions and suffering. It is here, in the context of a people steeped in YHWH montheism and the law that we find people holding up what appear to be contradictory. They contrast Deuteronomy 30:15-20 with with what seems quite clearly to not be the case. Often it appears that the wicked prosper and the innocent suffer. The wisdom literature is the Bible’s own candid and honest struggle with questions it cannot wholly answer – either within the limits of our own experience or even the limits of GOD’s revelation to us.